Directions: The Caledonia-Potosi Road Historical Marker [ Waypoint = N37 37.685 W90 38.999 ] is located near the intersection of McCune Street (Old Highway 21) and State Highway 21. From the Immanuel Lutheran Church get headed west on Pine Street. After about 0.1 miles, turn right onto McCune Street. 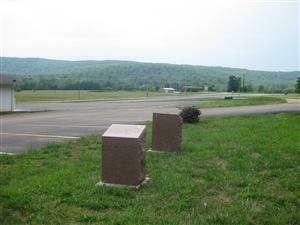 After about 0.4 miles, you should see two of the granite historical markers in a parking lot on your left. If you get to State Highway 21, you have gone about a block too far. 2:00 A.M. – 6:00 A.M. The Union Army evacuated Fort Davidson at about 2:00 A.M. on September 28. Despite having to pass between the campfires of Dobbin’s Brigade. 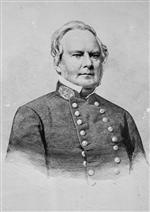 General Ewing marched his men undetected through the Confederate lines and to the Caledonia Potosi Road. 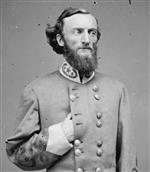 After learning the next day that the enemy occupied Potosi, Ewing turned westward at Caledonia, and despite pursuit by elements of Price’s Army, led his troops to Leasburg situated on the Pacific Railroad. 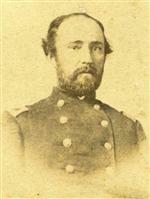 "Some time during the night,— I suppose, about one o'clock,—Captain Bradley woke us up and told us to get ready to move … Captain Bradley led his men out into the moat, then up the rifle-pit to its north end, then took the Caledonia road, and marched on without ever being halted by a picket or encountering any other obstacle. As we went up the valley we could see numerous camp-fires on each side of the road; but everything was quiet. When we had gone what I suppose to have been about three miles, we heard the magazine blow up. It made a report that beat almost any other I had heard through the day." "It was a solemn hour. A night attack is always fraught with dangers and horror exaggerated by the imagination because unseen; and to my mind the situation was more terrible because we did not know whether we would strike the enemy where his line was weakest or strongest. In low tones the commands were given and repeated along our line, and we went forward in column by twos, route step, arms at will, taking the Caledonia road. On we went, every ear intent to catch the word of 'forward into line' for a charge! Still we went on, unchallenged. On either side of the road the enemy lay about his camp-fires; pickets and sentries stood idly by the fires not twenty rods from our path, mistaking us, no doubt, for a body of their own force moving into position. They gave no evidence whatever of seeing or hearing us." "The enemy at Pilot Knob on the night following the first attack evacuated the fort, blowing up the magazine and leaving in my possession 16 pieces of artillery, a large number of small-arms, a large amount of army stores, consisting of bales of blankets, hundreds of barrels of flour, many [casks] of bacon, a great quantity of coffee, &c. After destroying the artillery, which I could not take with me, and distributing such of the stores as were needed among the troops, I [sent] Marmaduke forward in pursuit in command of his own and Shelby's division, which had rejoined the command." "I have the honor to make the following report of the number of pieces of artillery captured at Pilot Knob, Mo., on the 27th instant and the disposition made of them: Four 32-pounder siege guns, three 24-pounder howitzers, six Woodruff field guns, and two 24-pounder Coehorn mortars. In obedience to my instructions to render useless such as could not be removed I endeavored to do so by bursting, burning, and spiking. Two 32-pounders were burst, the others injured as much as possible, with the exception of two Woodruff guns given to Colonel Dobbin, and one Coehorn mortar given to Captain Hughey's artillery. These I had removed with a complement of ammunition for them. The remainder of the ammunition (about 2,200 rounds) was destroyed with the fort, also 5 caissons for 3-inch rifled guns. The harness, equipments, &c., were distributed to the various batteries." "I am very desirous that the enemy should be overtaken and captured. You will pursue him with your command (except a sufficient guard for your train) as soon as you can rest and feed your horses. I will direct General Shelby to join you with a portion of his division." 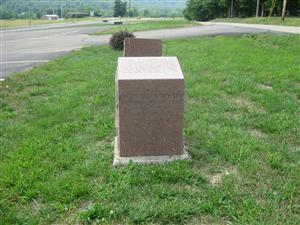 "My command is encamped three-fourths of a mile from this place toward Ironton. There is a creek about a mile beyond my camp, toward Ironton, which will be suitable for a camp for General Fagan. I met General Shelby here this morning and presume he will encamp near here. The Federals met a force of General Shelby's command here this morning and turned off toward Webster. I am preparing a force to follow them as soon as my men can obtain forage, &c."